Malaga boasts an intimidating number and variety of restaurants, and our guide on where to eat in Malaga will make it easier for you. You can search by area or by type of food and read our summaries to help navigate the delicious array of choices, or check out lists of recommendations from travellers and local experts. The city is dominated by the local cuisine, by virtue of its proximity to the sea and its abundant produce, and the country with its olive oils and free range cattle and pigs, pulses and legumes, and its cuisine steeped in history and the influence of Moorish Spain. But modernity is very much a feature of Malaga today, with the gastro tapas having scaled heights of invention undreamt of twenty years ago. 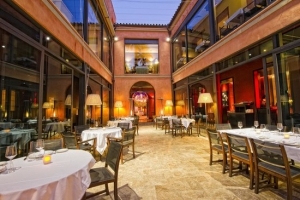 Whether you are going old school, or gastro and fusion, it's a great time to be going to eat in Malaga. Enjoy!